I cannot be in Milan and not see Leonardo Da Vinci's “The Last Supper.” So I set aside a day to do the art/museum hopping thing. 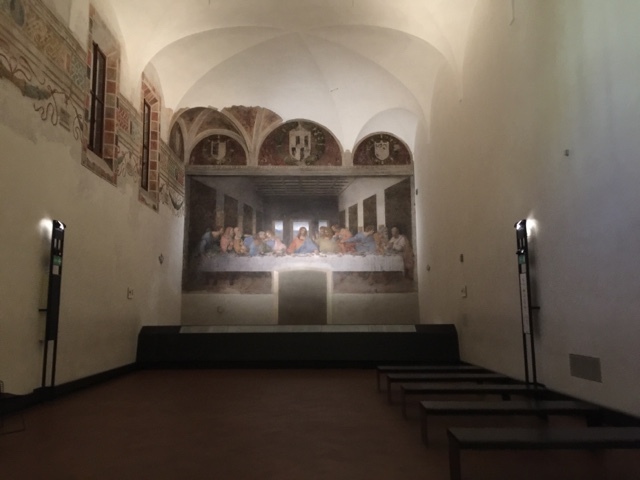 Although some familiar tour operators offered something called “The Davinci Tour” with guaranteed tickets to see the “Last Supper” for 79 euros, I didn’t want to join a tour group and be rushed; I wanted to enjoy and savor Leonardo’s masterpiece. 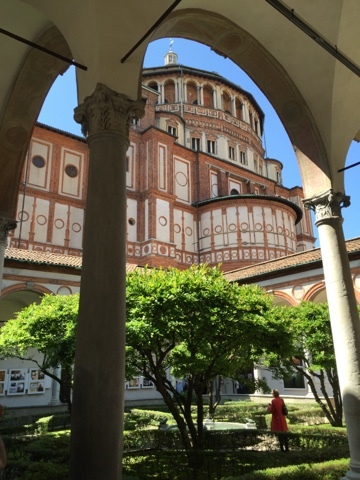 So the next day, I headed into the town center and looked for the Church of Santa Maria Delle Grazie. I hopped on the usual Metro yellow line from my hotel without studying the metro map that the concierge handed me. I figured the metro was easy and assumed that everybody in Milan would know where the famous painting was. I asked a fellow passenger, where the stop for the Maria Delle Grazie Church and she told me it was the next station which happened to be her stop. As we emerged from the metro, she continued to give me direction to the church. As it turned out, it was not the church I was looking for. I ended up at the Church of San Maurizio al Monastero Maggiore, another popular church visited by tourists. 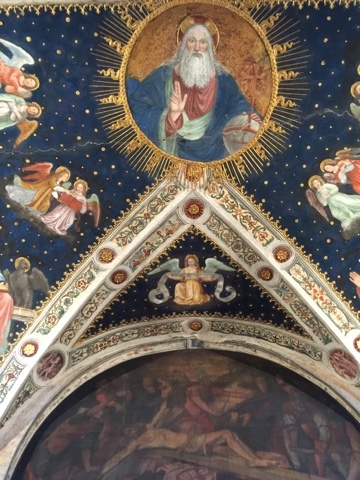 I walked into an open church (no entrance fee) and saw a few people admiring the church interior covered in beautiful frescoes from floor to ceiling (see pictures below). A volunteer docent greeted me and handed me an informational brochure. 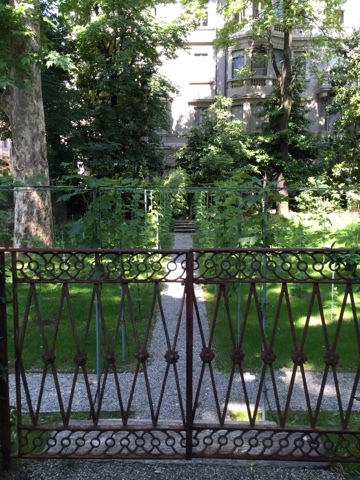 But I was so eager to go to the Church of Maria Delle Grazie and asked the docent how to get there. The docent said, “But mam, this is also a very important church…and you have to reserve months in advance to see “The Last Supper”. I promised him that I would be back after the visit to the Church of Santa Maria Delle Grazie. The Church of Santa Maria Delle Grazie was in the opposite direction of the San Maurizio Church on Corso Magenta Street. The ticket counter was in the ‘Cenacolo’ building, part of the convent that housed the famous painting. When I got there, the docent was right, there were no tickets available for the day. The clerk told me to check with the tour guides outside who sometimes sell extra tickets. I probably asked every tour guide there was to no avail. Sensing my desperation, a guide told me the trade secret. She told me to come back before eight o’clock in the morning as they allocate a number of unreserved tickets every day. I returned the following day and joined the people already in line before the ticket office opened. Then I heard the ticket counter clerk telling the couple in front of me that there were only tickets available for the afternoon slot. When it was my turn, I told the clerk that I wanted the earliest slot possible, she told me and motioned for me to be in the waiting room in 10 minutes. I paid 6.50 euros for the ticket. I joined a group of people in the waiting room where information about the painting and the restoration process and techniques were posted behind a plexiglass. Commissioned by Ludovico Il Moro, the duke of Milan, Leonardo worked on the fresco from 1494 to 1498, He substituted the usual method of the frescoe with a new technique called “a secco” on drywall to paint the Last Supper on the wall of the convent’s refectory. We then entered another room with glass walls before going into the room where the famous painting was. I had guessed that they had to make sure the temperature-controlled room was empty before letting the next batch of people in. No more than 25 people were allowed to go in 15 minutes interval. I had fifteen minutes to savor the painting. It was very easy for me who’s not an art connoisseur to see the beauty of the painting through the play of light and shadow. At second look, I saw an image that's very characteristic of Leonardo’s work like the Mona Lisa. John, the disciple immediately next to Jesus, has a long hair, youthful appearance and calm demeanor that I was reminded of the Dan Brown novel, “The Davinci Code”, where the author imagined that the image was of a woman (Mary Magdalene) – very intriguing. As a Catholic and having seen the scene depicted in prints and religious books, I saw more dramatic images in Leonardo’s work where he drew us into the story and faith. Across the Last Supper, I found another wonderful painting, “The Crucifixion” painted by Donato Montarfano. To be very honest, I took a photo of "the Crucifixion" to test that the flash on my camera was disabled before taking photo of "the Last Supper" . Then I went back to take a snapshot of the Last Supper. Considering the significance and fragility of the painting, I was surprised that photography with no flash was allowed at all. After admiring Leonardo's painting, I attended a mass in the adjoining Church of Santa Maria delle Grazie. After church, I decided to have coffee at the coffee shop across the church. To my pleasant surprise, the coffee shop was part of Leonardo’s vineyard, a tourist attraction included in the Leonardo Da Vinci tours advertised by Milan’s prime tourist operator for 79 euros. I paid 10 euros to tour the vineyard. Although the tour leader spoke several languages, he did not really do any narration, but showed us the corresponding places mentioned in the audio guide. The tour was well organized and very comprehensive. We started the tour from the courtyard with vine-covered walls. 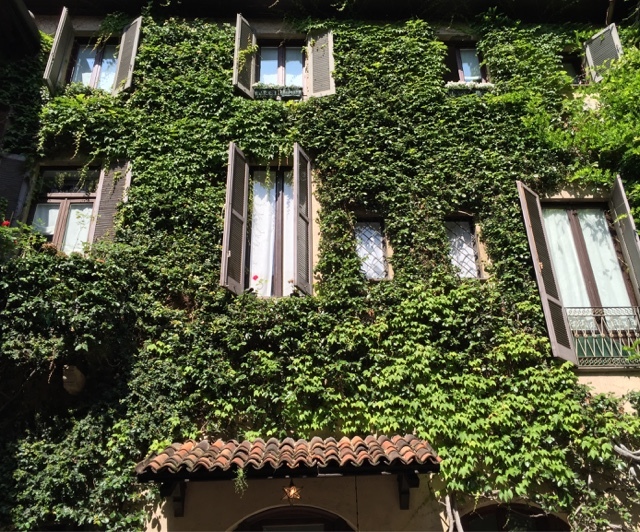 We then entered the house “Casa Degli Atellani” which was gifted by Ludovico, the Duke of Milan to the Atellani family and Leonardo who stayed there while working on the Last Supper. Passing the garden, we walked to the vineyard, the site specifically given to Leonardo as payment for his Last Supper. Leonardo who died in 1519 bequeathed the vineyard to his most loyal servants and remained in existence until World War II. Italian experts studied and performed genetic testing on the roots found in the old vineyard and recreated Leonardo’s vineyard. I returned to the Church of San Maurizio as promised. 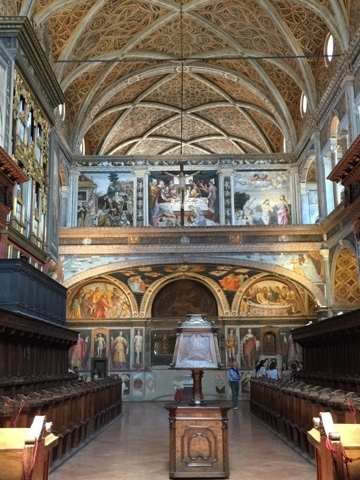 Here are some snapshots of the interior of the Church of San Maurizio, Convent side. 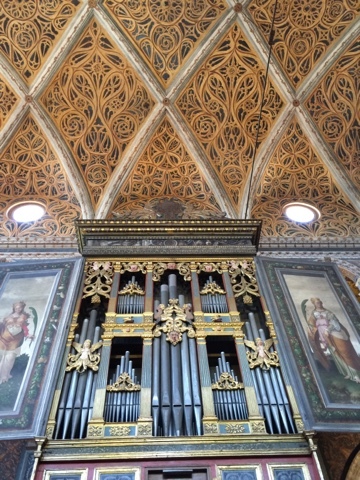 Organ designed by Giovan Giacomo Antegnati (1554) entirely by mechanical transmission, consisting of a keyboard of 50 notes and a pedal 20, constantly united to the keyboard.